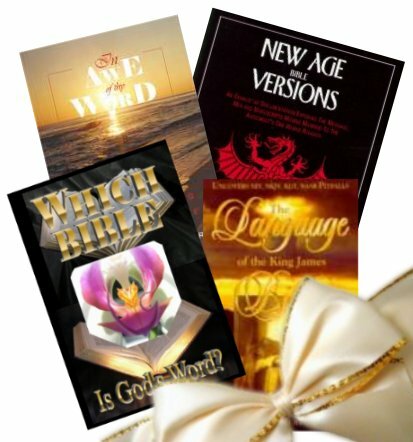 New Age Bible Versions is the all-time, international bestselling book, proving the perfection of the King James Bible and demonstrating the corruption of all modern versions. Nearly 300,000 copies worldwide have been sold, with translations into a dozen foreign languages. Noah Hutchings commented that the other recent books by other authors are based on the groundbreaking and painstaking research in this book. Get the original, now updated in 2018. "Thanks for your tedious labor of love in producing this monumental book on the New Age versions. We gave the book to folks in strategic positions and will mail out the flyers to intelligent believers. 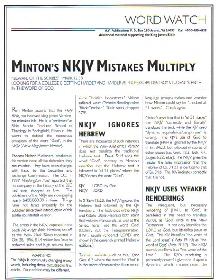 I call the KJV the real NIV - Never Improved Version." Author G.A. Riplinger has spent the last 2 years completely updating the entire book, expanding it greatly from its original 700 pages. It now addresses the recent ESV (Calvinist produced English Standard Version), the CSB (Southern Baptist Holman Christian Standard Bible) and the NKJV (New King James Version), as well as updating the various iterations of the NIV, NASB and others. It updates information on the latest corrupt Greek text used by new versions. It is searchable!!! No index needed. Now you can copy, past, email and post portions online. Includes links to footnotes and websites. Enlarge font size for easier readability. Click back and forth from the book to online digital editions of corrupt versions. 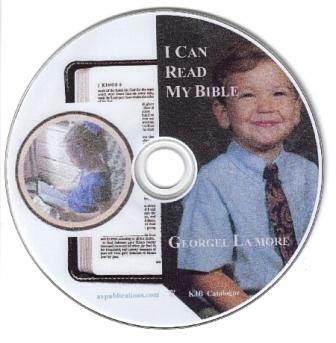 To make a paper copy of New Age Bible Versions, simply print it out on 3-hole paper or take the CD-ROM to Kinkos. Printed editions of the book may not be available for several years. Be the first to have the updated information, particularly on the corrupt ESV. This CD edition is for a single user license and should not be copied or distributed in whole to anyone other than the original purchaser. An adulterous woman, Barbara Aland directed the wording in the ESV, NASB, NIV, and other corrupt new versions. Why are good Christian men allowing her to usurp authority over them? The King James Bible is the only Bible that had no women involved in the translation or the underlying Greek text. The next time you hear someone say, "The Greek says..." know that it was said with a woman's voice. The latest editions of the corrupt minority Greek text, used by new version editors, unwary Bible students, and pastors to determine readings in the Bible, was edited by Barbara Aland, second wife of Kurt Aland, the chief editor of the Nestle-Aland Greel text, underlying many earlier new versions. In the early 1970s Kurt Aland abandoned his first wife and their three children to marry the attractive and youthful Barbara, twenty-two years his junior. Many were shocked by “His divorce from his wife, whom Althea and I greatly admired, and his marriage to his brilliant assistant who became director of the institute, for which Kurt had given his life…” (Eugene Nida, Fascinated by Language, John Benjamins Publishing Company, pp. 103, 104). The NASB 1995 was based upon the Nestle-Aland 26th edition, which appeared in 1979 and was developed under the dark cloud of the Alands’ tryst. Barbara Aland had studied in Rome at the Catholic Pontifical Biblical Institute. In the early 1980s she became a member of her now-husband's critical text committee and the Director of the Catholic/Protestant Institute for New Testament Textual Research, which edits and publishes the corrupt Greek texts underlying new versions. The goal of the Institute is to find old corrupt editions of the Bible to bolster evidence for weakening the Bible's text. Catholic monasteries and Egyptian rubbish heaps are the habitual haunts for their grave digging. 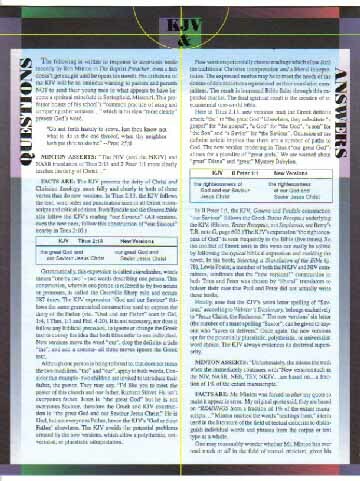 For example, the latest 2012 edition of Nestle-Aland 28th edition litters its apparatus with ‘new evidence’ for questioning the reading for Rev. 13:18 identifying the number of the mark of the Beast. 1. The current 2014 United Bible Societies’ The Greek New Testament, 5th edition, with its concise apparatus. 2. The 2012 Novum Testamentum Graece: Nestle-Aland 28th edition, with a revised critical apparatus, which is even weaker than that of the 27th edition, thirty changes to the text of general epistles, and the addition of papyrus 117-127 (e.g. 26th ed. had 92 papyrus and 28th edition has 127). 3. The Editio Critica Maior, on which the UBS 5th edition was based, purports to be a thorough examination of manuscripts. The corrupt ESV and HCSB were based upon the 1993 USB 4th corrected edition and the Nestle-Aland 27th edition, both textually like the 26th edition, yet very much under her direction as director of the Institute which published these editions. The men with her on the Greek text committee were 'subject' to her, as the director. This is very unscriptural. Changes to all of these editions are silently made between editions. As late as 1999 Barbara Aland founded a society for the study of the interpreters of Plato. See chapter 38 of New Age Bible Versions, for a thorough discussion of Plato and his anti-biblical new age philosophies, which that book proves are in corrupt new versions of the Bible. She retired in 2004, turning the Institute over to Holger Strutwolf, author of the critical Original Text and Textual History, as well as, Parallel Pericopes of the Synoptic Gospels. He teaches metaphysics at the university and writes positively about the Gnostic writers of the early centuries. His essay on Scribal Practices in John Kloppenborg’s book, Editing the Bible, demonstrates his dead dependence on Westcott and Hort’s methodology and dictum, (i.e. that the shorter reading is the original, despite Royse’s demonstration in Scribal Habits that the fuller reading is the original). The hunt to devour the Holy Bible continues. The wolf is a devourer, so of course, the shorter reading is generally preferred by ESV, NIV, NASB editors." 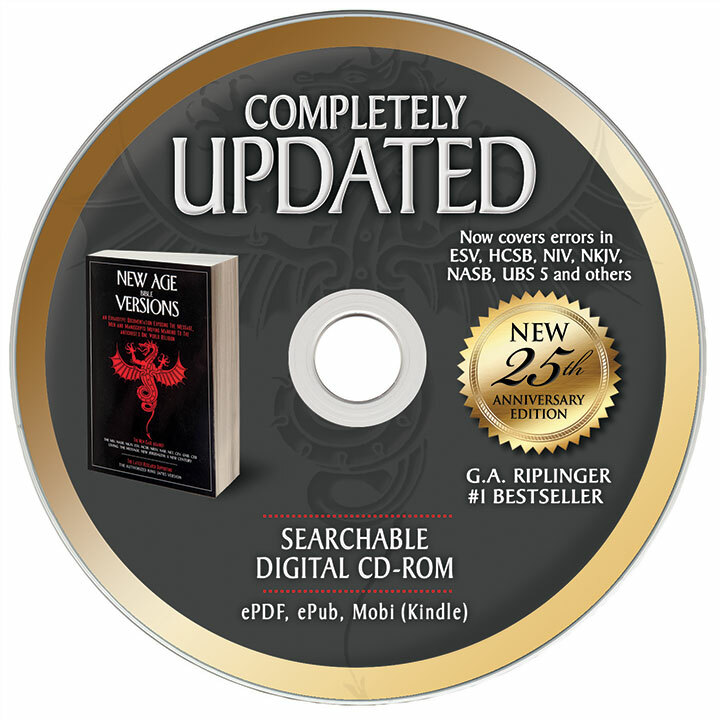 This is just a tiny example of the updates on the new digital CD-ROM edition of New Age Bible Versions.